Basically, the work that I am involved in is a simplified version of taxidermy. I don't think there is a whole lot of difference between how I, or other volunteers and scientists, prepare a specimen now, and how someone on Darwin's HMS Beagle would have prepared a finch from the Galapagos in 1831. Everything except the skull, wing and leg bones are removed from the body, a tissue sample is take and bird is stuffed with cotton and sewn back up. The bird skins are then mounted on styrofoam to dry for a couple of weeks, afterwhich they are labeled with all relevant information and put into the collection. The museum is full of flat file drawers that have specimens of every conceivable species. The specimens are used by scientists, researchers, artists, journalists for myriad reasons (i.e. size variation of bills within a specific species, plumage variation, geographic differences, and so on). 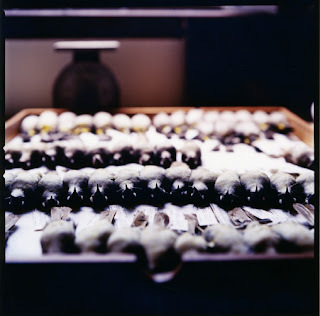 Above is a photo of what one of these drawers looks like containing the specimens. The photo is by Jason Creps. Check out more of his beautiful photos here. The birds that I work on have, for the most part, died by colliding with downtown buidlings. These birds are collected everyday by a fine group of volunteers: The Chicago Bird Collision Monitors. They bring what they find into the museum. If they find anything that is stunned or injured, it is brought to an area wildlife rehabilitation center. You have to have a permit to collect a dead migratory species of bird. Oddly, you do not have to have a permit to pick up a stunned or injured bird. I say oddly because if you don't know how to handle a bird properly, or any wild animal for that matter, you can cause a lot of trauma and stress, and even put yourself at risk for injury. I gather there are some strong opinions and debate on the matter as to what the proper thing to do is when one comes across a stunned or injured bird. I don't have a lot of direct experience with this, but I am of the mind that if I see a stunned bird the best thing for me to do is to shuffle it out of harms way and not pick it up. Often times it is just stunned and needs a bit of time to recover in a sheltered spot. If you see a stunned bird sitting in the middle of a sidewalk, find a way to place it out of harms way. Many stunned songbirds can be trampled on by unwitting people, or get nabbed up by greedy seagulls and crows. If there is anyone reading this that has done bird banding or collision work, feel free to comment and add your well informed opinions. We've had our fair share of kamikaze birdies crashing in our windows...some of them have not made it...but others, with very little help from us (just letting them chill out in a secure place) have recuperated and flown away...yay! Diana: Love your blog and your art. :-) I started trying my hand at watercolor this summer, but as yet the results aren't too satisfying. I love birds and birding, though, and your approach to painting birds is an inspiration. Thanks! Here is an article I published on my website last year about a black and white warbler I found at Sprint headquarters (a window strike) which led me to Mark Blair Robbins, who manages the ornithological collection at Kansas University in Lawrence. Mark gave me a tour of the collection, showed me how they prepare specimens, and even showed me the drawer where the warbler I found will be stored. Lots of pictures. BTW: found your site from the BeagleProject blog.